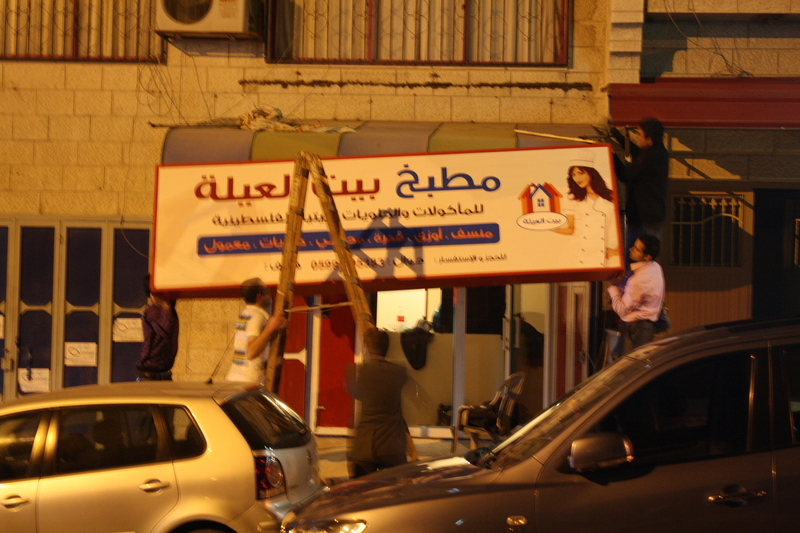 Along the sidewalk of An Najah Street, FWEN Participant Nehaya in the company of family and friends, unveiled the sign to her new restaurant, “Matbakh Beit Al-Eleeyah.” While the official grand opening is set for Saturday, March 26, 2011, Nehaya took the opportunity thank all those that supported her throughout the last year, including her friend and fellow FWEN participant Sahar, who designed the new sign. Nehaya’s restaurant will provide traditional Palestinian food to university students interested in a home-cooked meal in place of more typical student foods such as fast food. As a student at An-Najah University (she graduated in 2007 with a degree in biotechnology), Nehaya noticed a problem that is universal to students around the world: Because they live far away from their families while at school, many students miss home-cooked meals and crave “comfort food.” Though her participation in the FWEN project, Nehaya acquired the leadership and business skills necessary to turn her idea into a reality. ABOUT FWEN: During the Fifth Annual Clinton Global Initiative (New York, September 2009), the Cherie Blair Foundation for Women and Tomorrow’s Youth Organization (TYO) committed to contribute to women’s economic empowerment in Nablus. The project, Fostering Women Entrepreneurs in Nablus, is now underway at the TYO Center in Nablus and at a satellite location in Lebanon. P1030291, originally uploaded by tyo_nablus. On Wednesday, February 23, 2011 Jillian of the Cherie Blair Foundation for Women visited Tomorrow’s Youth Organization and met with members of the TYO-CBFW collaboration Fostering Women Entrepreneurs in Nablus. Check out all the photos from the meeting on Flickr. FWEN Participant Nehaya received an enormous opportunity when she was selected to participate in the Goldman Sachs 10,000 Women “Women Entrepreneurs and Leadership” Certificate Program at the American University of Cairo. Along with other female entrepreneurs from Egypt, Jordan, and Palestine, Nehaya participated in this five-week training program to gain in-depth knowledge in operations management, finance, and human resources, among many other topics. Watch this video to hear Nehaya talk about her favorite parts of the 10,000 Women training and what she gained from the experience. The Fostering Women Entrepreneurs in Nablus (FWEN) program is co-sponsored by Tomorrow’s Youth Organization (TYO) and the Cherie Blair Foundation for Women, with support from the Small Enterprise Center in Ramallah. FWEN participant Aya plans to become the first woman in Palestine to own her own sheep farm. She is full of ambition and has been hard at work on her business plan during the past year, gaining experience and confidence from the FWEN training sessions. Watch the video below for a chance to hear Aya speak about her business and her dreams for the future. FWEN participant Yasmeen is not waiting for the end of training to put her business expertise to work — she has already been running a successful and profitable clothing shop in her home village for several months. Watch the video below for a chance to see Yasmeen at work and learn more about the social impact of owning a business for her and her family. The Fostering Women Entrepreneurs in Nablus (FWEN) program brought a successful year of training, mentorship, and business creation to a close with a retreat at the Movenpick Hotel in Ramallah from Thursday, December 9, to Saturday, December 11. The 12 women participating in the second phase of the FWEN program benefited from a weekend together to brainstorm and evaluate their progress, as well as to take part in several informative workshops. On Thursday evening, Sandra Khoury spoke about how working women can strike a successful balance between professional and family responsibilities. Mrs. Khoury is General Manager at Pharmacare PLC and has significant experience with women’s and youth development programs in Palestine. On Friday, Esperanza Tilghman, Public Diplomacy Officer at the U.S. Consulate in Jerusalem, led a workshop on public speaking and presentation skills, and continued an informative question-and-answer session with the FWEN women over lunch. Throughout the retreat, TYO staff members Suhad Jabi, Psychosocial and Program Specialist, and Fatima Irshaid, FWEN Project Manager, led a number of sessions allowing the women to address personal growth and evaluate their progress in the program thus far. Suhad emphasized interpersonal skills and healthy ways of addressing emotions such as fear and anger. During the final program evaluation, the women highlighted new skills they had learned through the FWEN trainings, including time management, problem-solving, self-confidence, self-expression, and professional communication. Finally, the chance to leave Nablus for a weekend had some additional benefits for these budding female entrepreneurs. Project Manager Fatima Irshaid says that for many of the women, the retreat was the first time they had been in a hotel and it was an exciting new experience for them. The women took advantage of the luxury and privacy of the hotel to relax and get comfortable; they changed out of their formal clothing and finished up the retreat in their pajamas. Fatima observed that in addition to learning new skills during the retreat, the participants were “living something new.” She noted that over the course of the FWEN program, many of the women have changed their opinions on what constitutes appropriate behavior for females in Palestinian society. This newly acquired courage and openness can only help them to succeed in the future as entrepreneurs. On Tuesday, December 7, 2010 Nadia Bilbassy interviewed TYO Founder and President Hani Masri for MBC Arabic’s “Sabah il Kher” (Arabic: Good Morning) program. During the interview, Mr. Masri spoke about the importance of investing in children, youth and women in Nablus, Palestine, where he was born and many of his family members live today. The kids come to our Center to take classes in IT, sports, music and many other subjects that are not available at their schools, Mr. Masri told MBC Arabic on Monday at TYO’s Virginia office. Mr. Masri also commented on the importance of programming for young women and mothers. He added that the TYO Center is open to the participants’ mothers who are eager to engage in English, computer science and aerobics classes. Moreover, TYO developed a program to train young female university students interested in starting their own businesses. Following the interview, Ms. Bilbassy commented on TYO’s innovative approach and commended Mr. Masri for investing in developing societies in the Arab world.